These gals are waiting patiently for their food scrap feast! I came for the chickens, bunnies, and baby goats. I stayed for the thirty-two thousand pounds of food scraps. Governors Island, reachable only by ferry from the southern tip of Manhattan or Brooklyn Bridge Park, is burgeoning as a warm-weather destination for art, music, food and revelry. Covered in sprawling lawns, carless walkways, and stunning views of the water, city, and Lady Liberty herself, the former military and Coast Guard base is now a bucolic escape for nature-starved New Yorkers who crave sun drenched splendor in the grass. 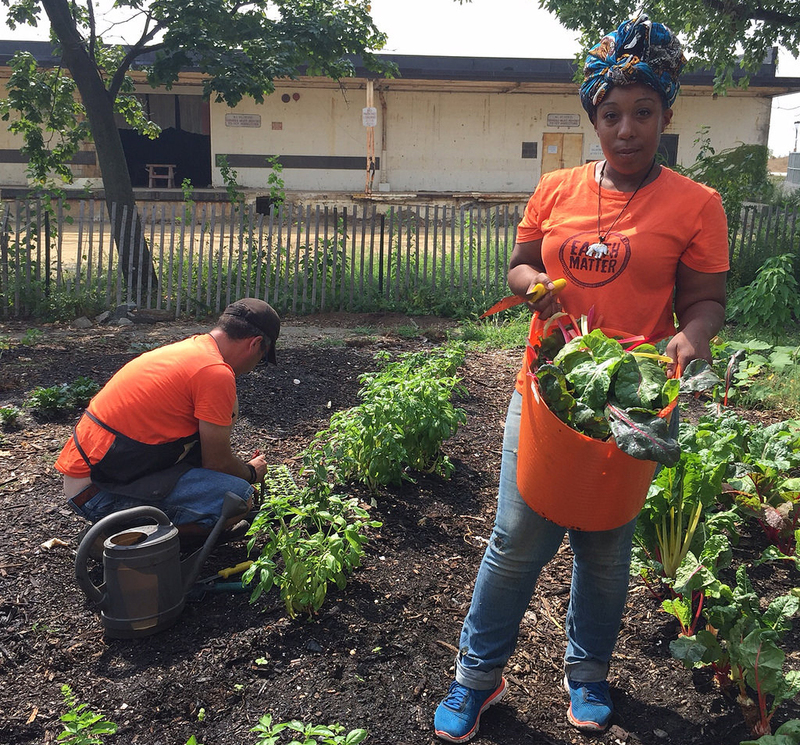 Year round, it is also home to research and educational groups like Earth Matter, the New York Harbor School and The Governors Island Teaching Garden run by Grow NYC. Earth Matter plays a vital role in reducing the Island’s carbon footprint, composting all of the landscaping trimmings produced on the island. The group also partners with The Trust for Governors Island and onsite vendors to green special events, managing the source separation of waste and composting all food and compostable serviceware. As if that wasn’t enough, the Earth Matter team is one of a handful of city organizations that process residential food scraps in collaboration with the NYC Department of Sanitation’s NYC Compost Project and Grow NYC. 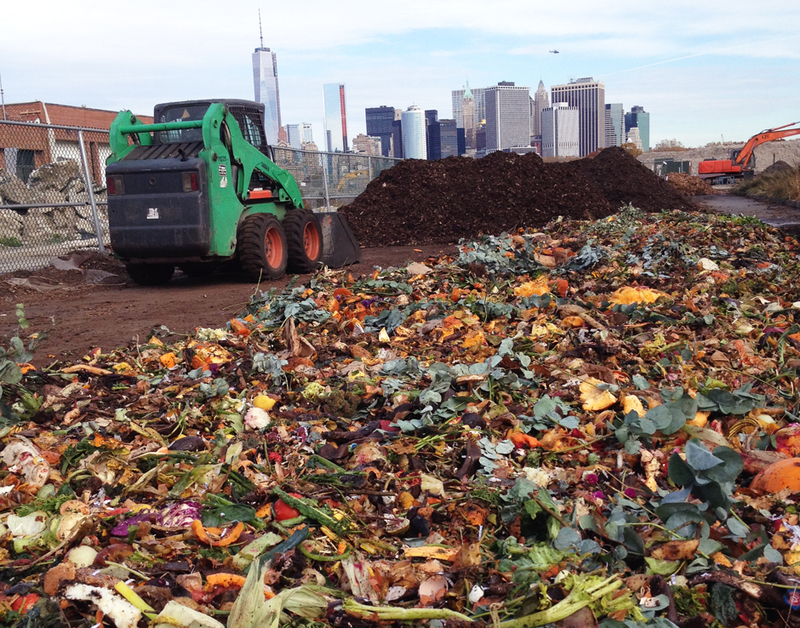 Each month, they receive a whopping delivery of thirty-two thousand pounds of food scraps collected from New York City residents at four Grow NYC greenmarkets in Brooklyn (currently the organization hosts 40 collection sites city-wide). Working with their team of apprentices and volunteers, Earth Matter uses the scraps to feed their animals, supply the various systems in their Compost Learning Center, and build aerated static compost piles that turn those scraps into black gold. I started volunteering with Earth Matter several years ago because I was drawn to the chickens, rabbits and goats. Aggressive squirrels, threatening rats, and dive-bombing pigeons made up most of my wildlife interactions in NYC, and I longed to be around creatures more friendly and fun. 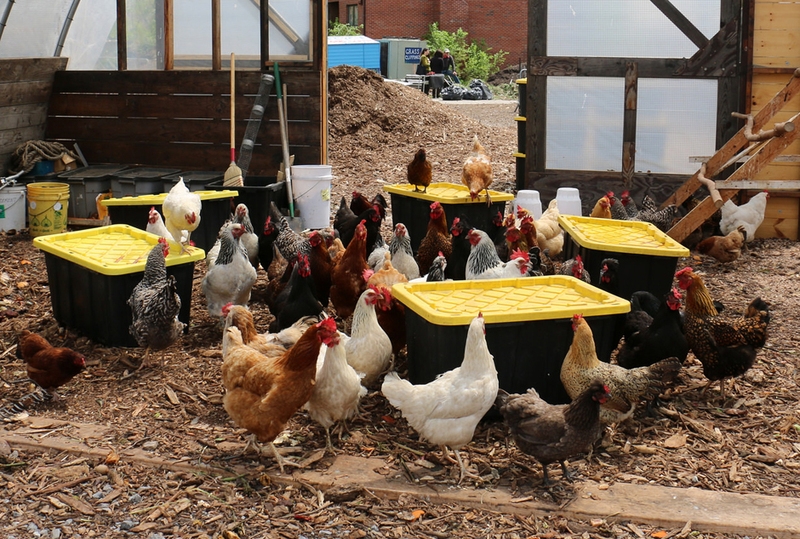 Scraps diverted from the landfill provided food for microbes, creepy crawlies and animals. The creatures, large and small, nourished their bodies on the scraps while transforming them into manure, speeding up the transition of food scraps into food for the soil ecosystem. Animal Care days have brought many educational, corporate and volunteer groups to the Compost Learning Center. Guests have included the Staten Island Coast Guard and the Friends Seminary School. Another popular Earth Matter volunteer opportunity is building compost windrows. This transformative experience is packed with eye-, mind- and bicep-popping wow-factor. 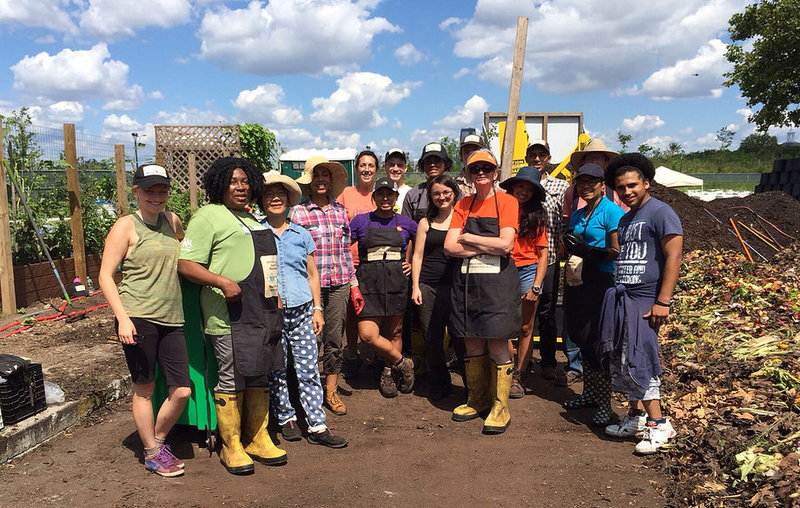 A team of volunteers is ready to make compost magic happen! Windrows are basically giant compost piles on steroids, built all at once for batch composting. When first constructed, each windrow is about 7 x 14 x 70 feet. With the help of a skid steer loader, the compostables are mixed and placed over pipes that help circulate air through the pile — a vital component in the composting process. Eventually, the piles reduce to thirty or forty cubic yards of gorgeous compost, which is then used to nourish the island’s verdant landscape. Dressed in muck boots and an Earth Matter apron, I joined about dozen other volunteers and Earth Matter staff for a windrow build one fall. Together we opened tubs that held fourteen thousand pounds of food waste, poured them out onto a vast stretch of woodchips and leaves, and raked it into manageable layers. To help speed decomposition along, we chopped up clunky whole items such as pumpkins and grapefruits to increase surface area for microbial activity. We then washed and restacked all of the bins to ready them for a fresh load of scraps. Just SOME of the food scraps that went into the pile when I volunteered. Unlike the fuzzy, feel-good reaction I had to my animal care experience, I felt a complex mix of emotions during the windrow build. The physical act of dumping out fourteen thousand pounds of food scraps was shocking, humbling, worrying and a source of hope all at the same time. Most of the scraps were peels and trimmings, but some of the produce was so heartbreakingly pristine I wanted to reach down, grab it, and take a bite. From the point of view of a farm animal, I imagine the entire spread looked like a beautiful, heaping buffet — so much more tender, juicy and nutritious than what most feedlot livestock are forced to guzzle down. One third of all the food in the world is wasted each year, and seeing a tiny fraction of what gets discarded provided a sobering glimpse into the larger issue. Still, I was thrilled to see this much food waste diverted, the result of individuals opting into a green alternative to throwing it away. It’s astonishing what a collective effort of like-minded people can accomplish, one banana peel and tea bag at a time. The Soil Start Farm, Earth Matter’s newest endeavor, aims to close the loop on the organics cycle at the heart of their mission. Delicious harvest, grown by farm trainees. Housed on 3000 square feet, the farm is an educational training space that utilizes compost to grow flowers, herbs and vegetables. Open to the public and tended by volunteer farm cooperators, the space allows for experimentation with a range of organic soil and gardening practices. A share of greens — delights such as broccoli, collards, swiss chard and basil — goes home with each volunteer at the end of a work shift. Some of it also goes to vendors on Governors Island, who can serve it freshly harvested in their gourmet fare. To learn more about Earth Matter and their upcoming Farm-to-Table Brunch benefit on Sept. 20, visit Earth Matter’s website.